KEY's share price looks attractive at a forward FY-2019 P/E ratio of 9.0x, especially when we compare it with its 10-Year P/E ratio average of 12.2x. Compared with other institutions its size, KEY offers a compelling dividend along with strong growth potential in commercial lending. With approximately $139 billion in assets, KEY ranks as the 27th largest banks in the United States. Commercial lending and residential real estate (including HELOCs) makes up nearly 93% of the outstanding loan portfolio, which has insulated KEY against net interest margin contraction. 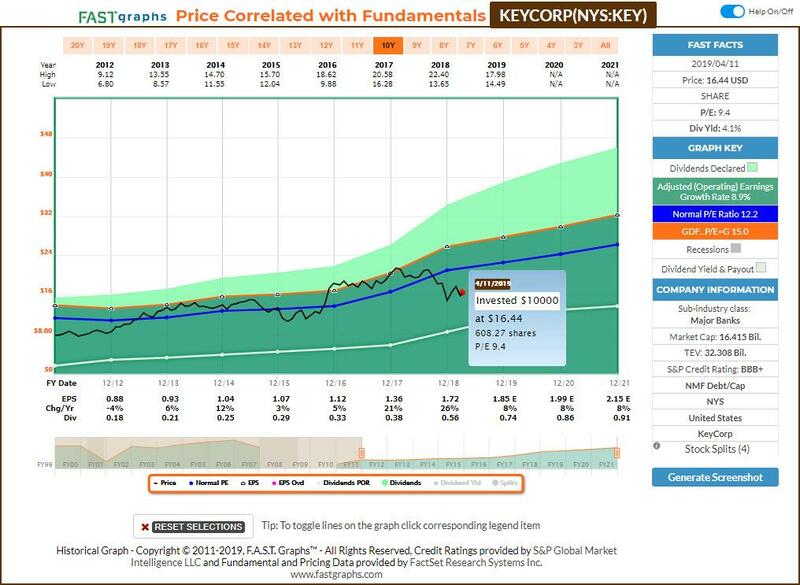 It was requested by a reader of a previous article that I look into KeyCorp (KEY) (which is the parent company of KeyBank) and provide my opinion of the bank and its current operations. As many of you know, I enjoy reviewing banks, and KEY is one of those that has never truly landed on my radar. That's not to say that KEY isn't worth investing in but rather that it is a great reminder of how dependent I am on the Seeking Alpha community for feedback, suggestions, etc. This examination of KEY is especially pertinent because earnings come out on April 18 (Thursday), and I personally believe (after reviewing FY-2018 results) that buying before earnings could be a great long-term entry point. 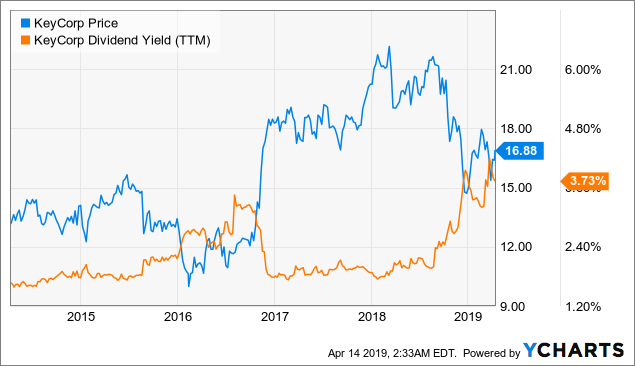 Additionally, KEY currently offers a 4%+ dividend yield, which makes it even more attractive given its five-year dividend yield average of 2.30%. Since 2016, the outstanding home equities balances have continued to decrease even though home values have improved significantly. This bucks the trend of what we have seen in many markets across the United States. Additionally, it was noted in the 2018 10-K Report that approximately 60% of these equities are in first lien position. Consumer indirect loans have increased from 3.5% of total loan balances outstanding at the end of 2016 to 4.1% at the end of 2018. It is also important to note that consumer indirect lending was the only segment of consumer lending that has increased as a percentage of outstanding loan balances during this time period. Personally, I would've expected to see an increase in the outstanding balances of home equities especially because it is a rather safe investment that provides healthy amounts of interest income. The advantage of KEY's HELOC portfolio is that it is rather safe because 60% of them are in a first lien position. Although balances have continued to decrease, it is important to remember that HELOCs still make up 48% of the outstanding consumer loan portfolio balance. HELOC in New York, Washington, and Oregon make up roughly half of the outstanding home equity loan balances. The reason why I am focused on these three states is that they also have some of the highest real estate prices in the nation. Should a downturn occur, there is the potential that these states could have farther to fall than the others will. On a positive note, California has only $27 million of HELOC exposure, which I consider to be a very positive aspect. From a residential mortgage perspective, I am comfortable with the reasonable exposure to Washington and Oregon, but I'm extremely happy with the absolute minimal exposure to California (because real estate continues to become more ridiculously priced every day). In my opinion, Seattle and Portland pricing isn't nearly as distorted as the housing market in California is. I will concede that I continue to monitor Seattle and Portland housing prices because I consider it to be an ongoing issue. Overall, I am pleased with the composition and size of the consumer loan portfolio relative to the rest of KEY's lending operations. From the perspective of the financial industry, KEY has reasonable credit rating score from Standard & Poor's, Moody's, Fitch, and DBRS. In order to give more color on KEY's credit ratings, I decided to look at a direct competitor that is slightly larger than they are and has a piece of operations in a similar footprint. I chose Fifth Third Bancorp (FITB) because it is based out of Cincinnati and is slightly larger in size at $141 billion in assets (FITB is the 26th largest bank in the United States). As I skimmed over the two sets of credit ratings, the main difference that I could find was that KEY (specifically KeyBank) had a Moody's rating of P-2 compared with FITB's rating of P-1 (therefore favoring FITB). Outside of this discrepancy, there were no major differences that I felt were concerning. Net interest margin (NIM) is a metric that has challenged many banks over the last two years as the Fed has continued to raise interest rates (although it appears they have plateaued) which has increased the cost of funding and put downward pressure on the ability of banks to increase margins. Many banks have seen their NIM margin decrease over the last few quarters, which makes KEY's flat NIM attractive by comparison. 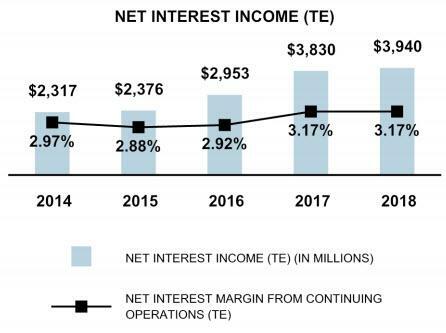 What this means is that net interest income grew at the same pace as the average cost of deposits. The net interest margin is calculated by dividing taxable equivalent net interest income by average earning assets. 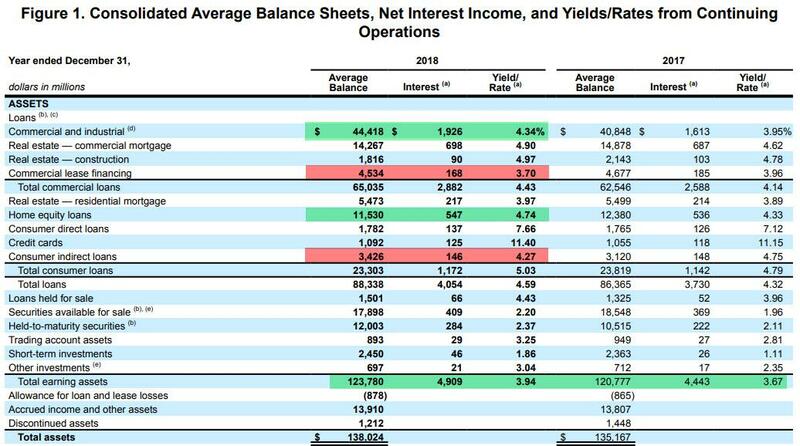 Another way to look at this is to compare the change in average loans and the yield associated with them while also looking at the change in average deposits in the cost associated with those funds. At first glance, something that didn't make sense is that the yield on average loans actually increased by a larger amount than the cost of deposits from 2017 to 2018. Average loans sign increase in yield of 27 basis points compared with an increase in deposit costs of 22 basis points. To help explain this, we need to consider that average deposits grew by a larger amount (in dollars) than average loans did. This is significant because it means that KEY is actually seeing margins expand on their loan portfolio at a pace that is faster than the increasing cost of average deposits. Commercial lending growth and expansion of interest rate/yield were the primary reason for the expansion yield on earning assets. Additionally, consumer loans like home equities were able to generate more interest in 2018 because of the higher interest rates even though total HELOC balances were down by $850 million year-over-year. The increasing cost of deposits is an important topic because every bank and financial institution has been plagued in their attempt to increase deposits at the cheapest rates possible while also funding loans with a strong yield. Needless to say, the increased cost of interest-bearing deposits is nothing to be surprised about, but it only tells one half of the story since we also need to consider how noninterest-bearing deposits have fared from 2017 to 2018. Noninterest-bearing deposits are a bank's favorite source of funds because it provides the lowest cost of capital possible (which is free). During times of record-low interest rates, it becomes easy for a bank to grow the source of these deposits because customers generally care less about an almost non-existent interest rate than they do about the ease of accessing funds. The drop of over $800 million in this category isn't concerning necessarily, but it is an important detail that helps explain the increased cost of deposits. Net charge-offs are becoming an important topic in the banking sector because we are reaching a point in the credit cycle where higher interest rates will naturally increase the number of loans that charge-off. Net charge-offs specifically refer to the difference between gross charge-offs in the recovery of any debt. The amount that isn't able to be recovered or is expected to be unrecoverable is what we refer to as net charge-offs. Although taking losses on loans isn't something that sounds very attractive to investors, it is important to remember that every bank needs to engage in some form of risk (like any business) in order to generate a sufficient return. The purpose of monitoring net charge-offs is that it can provide us with the type of insight we need to determine whether or not management is taking appropriate risk in lending. KEY has an exceptionally low net charge-off ratio of .26% in FY-2018 that is well below management's expectation/guidelines of .40% to .60%. For additional perspective on this, FITB had a net charge-off ratio of .35% in Q4-2018. Even more importantly, KEY has demonstrated that their low net charge-off ratio has been consistent over the last five years. If we drill into these numbers further, we can see that the small uptick in net charge-offs during 2018 were entirely related to commercial lending while consumer lending saw a slight decrease year over year. Simply put, KEY is doing incredibly well with this metric to the point where net charge-offs could double, and it would still be well within the .40% to .60% range established by management. Looking towards FY-2019, management has also stated that they "expect net loan charge-offs to average loans to remain below our long-term targeted range of 40 to 60 basis points." In my previous work, I have focused on the efficiency ratio as one indicator of whether or not the situation is improving/worsening. The efficiency ratio helps us understand whether management is properly utilizing its assets to generate revenue. It's not uncommon to hear that an efficiency ratio of 50% (or less) is considered to be desirable, but it also depends on whether or not the bank is focused on retail or commercial activities. KEY uses the cash efficiency ratio (which is a ratio of two non-GAAP performance measures) because it excludes the impact of intangible asset amortization. As stated in the FY-2018 Annual Report, management uses this measurement claiming that "this ratio provides greater consistency and comparability between our results and those of our peer banks. Additionally, this ratio is used by analysts and investors to evaluate how effectively management is controlling noninterest expenses in generating revenue, as they develop earnings forecasts and peer bank analysis." The FY-2018 cash efficiency ratio of 60% means that for every $.60 of expenses, KEY was able to generate one dollar of revenue. KEY's cash efficiency ratio has improved significantly since 2016. Although KEY's cash efficiency ratio looks unremarkable over the last five years, it does fall in line with its competition. For example, FITB had an FY-2018 efficiency ratio of 58.8%, which saw similar improvement from FY-2017 efficiency ratio of 63.3%. Even more importantly, management has openly stated that they believe they can reach a cash efficiency ratio between 54% and 56% in the second half of 2019. Prior to the financial crisis, KEY paid a compelling dividend of $.375/quarter or $1.50 annually and topped off I just over $38/share and trading at a P/E ratio of roughly 13.7x earnings (based on annual earnings in 2016 of $2.91/share). The dividend continued to be paid quarterly, but not before it was dropped to $.01/quarter or $.04/year. This 97%+ drop was indicative of the majority of the financial sector with banks like Washington Trust Bancorp. (WASH) and Bank OZK (OZK) bucking the trend by maintaining their dividends (WASH maintained its dividend in 2008 and 2009 before resuming growth and OZK continued to increase its dividend). Fortunately, KEY has resumed growing its dividend and has continued to do so for the last eight years. It is even more important that KEY has made substantial increases in its dividend while maintaining a low payout ratio of 32.9% (as of 12/31/2018). KEY's five-year dividend growth rate currently averages 21.3% annually and includes its most recent quarterly increase of 41.7%. When we consider the dividend yield from a historical perspective, we can see that KEY has a much wider spread and suggests that there is potentially more upside in the price of KEY's stock than there is for FITB's stock. Based on its conservative payout ratio and continued growth, I expect to see this trend continue in a way that is similar to the type of dividend growth KEY offered prior to the financial collapse in 2007. FastGraphs has quickly become one of my favorite tools because it provides a simple approach to determining whether or not shares are undervalued based on historical trends. KEY's 10-year P/E ratio average of 12.2x is the baseline with which we will evaluate the stock primarily because I do not want to include the years of the distorted P/E ratio that arose during the heart of the financial crisis. During the last 10 years, KEY has maintained a valuation that is slightly above/below the blue line (which is our P/E ratio of 12.2x). In fact, the share price has tracked this P/E ratio average so closely that the furthest it has fallen below this line is over the course of the last four months. I contend that the share price has been unfairly beaten, given the results shown on the FY-2018 Annual Report. On April 15, 2019, the share price at the market close was $16.66, and based on FY-2019 earnings of $1.85/share, we arrive at a forward P/E ratio of 9.0x. If share prices were to recover back to a P/E ratio of 12.2x, this would suggest a fair value of $22.57/share. In other words, it appears that there is a 35.5% upside potential (excluding the dividend) for investors who are willing to purchase at these levels. Taking the forecast one step further, we could also determine that the P/E ratio floor is around a multiple of 8.4x earnings, which was hit in December of 2018 when the market had its temporary meltdown (this is the lowest P/E ratio I could find when looking at KEY's 10-year history). Based on FY-2019 earnings, this would suggest an absolute bottom in the stock price $15.54/share or a downside of approximately 6.7% based on the current share price of $16.66. The image below represents the closest P/E ratio illustration I could make on FastGraphs of 8.2x earnings. At the top end, KEY has seen its P/E ratio hit a high of 16.3x earnings, which was last seen in December 2016 (this is the highest P/E ratio I could find for KEY when looking at its 10-year history). Based on FY-2019 earnings, this would suggest shares are potentially overvalued at $30.16/share and suggests a possible upside of 81.3% based on the current share price of $16.66. The image below represents the closest P/E ratio illustration I could make on FastGraphs of 16.5x earnings. I want to clarify that I do not necessarily believe that either of the worst or best-case scenarios mentioned in the previous section is actually plausible over the course of the next year. 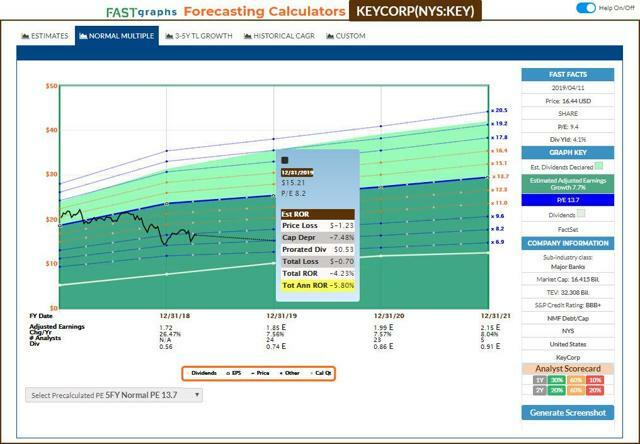 The intended purpose of these scenarios is to show that the potential downside for KEY's stock price is minuscule when compared to the potential gains. As for my opinion of KEY, I consider the stock to be a Strong Buy based on the following points from my analysis. Continued concentration in commercial lending has improved the yield on average total loans to where KEY saw no contraction in its net interest margin between FY-2017 and FY-2018. It is also worth noting that 84% of commercial loans are variable rate, which acts as a natural hedge in a rising interest rate environment. Although KEY has a high concentration of outstanding HELOC balances in New York, Washington, and Oregon, I am not overly concerned as most of these HELOCs are in a first lien position, which suggests there is a large margin of safety in the loan to value of these residences. Net charge-offs remain at record lows and are well below management's expected net charge-off ratios of .40-.60%. KEY's commitment to dividend growth exceeds many of its competitors, and the current yield of over 4% is extremely attractive for dividend investors. On a strictly P/E ratio basis, it appears that KEY is attractive at a forward P/E ratio of 9.0x. This is just above its lowest valuation of 8.4x earnings and is well below its 10-year high P/E ratio of 16.3x. This suggests that there is significant upside assuming that management continues to execute well. 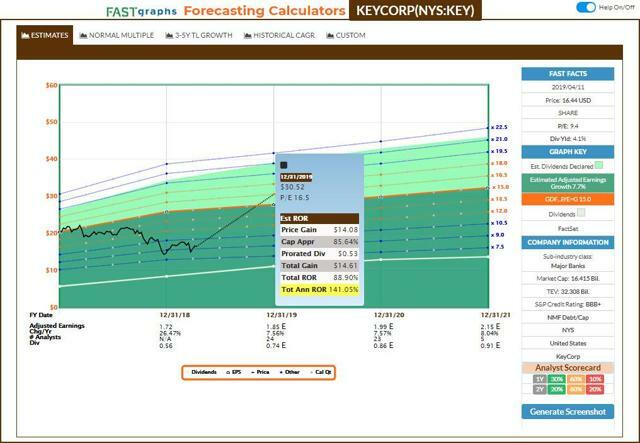 KEY continues to see strong upside, which is why I plan to initiate a half position before the release of earnings. Disclosure: I am/we are long OZK. I wrote this article myself, and it expresses my own opinions. I am not receiving compensation for it (other than from Seeking Alpha). I have no business relationship with any company whose stock is mentioned in this article. Additional disclosure: My clients' are currently long OZK and WASH. We may initiate a position in KEY over the next 72 hours (for myself and my clients'). This article reflects my own personal views and is not meant to be taken as investment advice. It is recommended that you do your own research. This article was written on my own and does not reflect the views or opinions of my employer.